Urzoga gra-Shugurz is an Orc warrior in charge of Cidhna Mine in Markarth. She is the sister of Mulush gro-Shugurz who works the smelter outside the prison entrance. In daily life, Urzoga watches the 'public entrance' to Cidhna Mine along with three other guards and will, starting at 8am, stand on the bridge leading to the enclosed chapter of the mine, drinking and eating. At 8pm she will either guard the cell door to the east or sleep in one of the available beds. She wears a set of steel armor with either cuffed or shin boots and steel Nordic or Imperial gauntlets. She carries a leveled bow with twenty arrows (up to elven quality at level 20) and wields a leveled mace of the best possible quality. She also carries a steel shield, the key to Cidhna Mine and a belted tunic. If you pay the mine a visit, Urzoga will approach you from the bridge above, shouting: "Cidhna Mine's for prisoner scum only. Keep out." When asked why you can't access the mine, she will explain: "This is a jail, owned by the Silver-Blood family. We use the prisoners to mine for ore. It's the most secure prison in Skyrim. Throw scum in, close the gates. No one gets out. So unless you're here to dig, you don't belong here." If you tell her she doesn't look like a guard, she will explain that she is, in fact, a mercenary for the Silver-Blood family: "We're not. The Silver-Bloods pay our wage. Every man here is a trained mercenary." On subsequent meetings she will say: "I'm in charge of the prisoners here. ", "No funny business. I'm watching you." or "You do something out of line, I'll put you down." 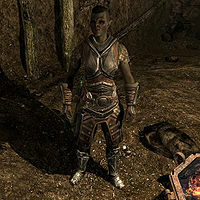 If you are arrested in Markarth, or when the guards frame you for murder at the end of The Forsworn Conspiracy, you will find yourself at the wrong side of the bars inside Cidhna Mine and Urzoga will be the first to greet you: "All right, prisoner. Eyes front. You're in Cidhna Mine, now. And we expect you to earn your keep. There's no resting your hide in a cell in this prison. Here, you work. You'll mine ore until you start throwing up silver bars. You got it?" Three options are available. If you ask her when you will be released, she will respond with: "You'll pay off your debt to the Reach. Just work and you'll earn your freedom." If you just accept your fate, she will say, "Good." If you choose to provoke her and ask her to repeat, she will angrily threaten you with: "Don't get smart with me. I'm in charge. You keep it up, I'll have your toes cut off." Regardless of your choice, she will call out: "All right. Open her up. Now, you. Get down there." You will not be able to interact with her any further and she will wait until you enter the prisoner's area of the mine. When the gate shuts behind you, she will leave the cell and get back to work near the entrance. During No One Escapes Cidhna Mine, she was supposed to respond differently when you ask about when you will be released; however, the quest stages are set up incorrectly, so the line will never be heard: "You won't. The Jarl has ordered a life sentence for you. Get comfortable in the dark, 'cause you'll never see the sun again." Killing Urzoga will cause you to be stuck in Cidhna Mine when jailed, whether during No One Escapes Cidhna Mine or otherwise.